BMW is known for having a lineup of fun and sharp handling sports cars. The 2 Series is BMW's most raw take on that formula. 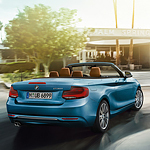 The 2 Series can either be had as a coupe or a convertible. In either specification, the 2 Series is a fun popular 2-door sports car. BMW is also known for being a luxury car brand and they don't go lean on the features for the 2 Series. The 2 Series can be equipped with navigation that has real-time traffic updates. This system knows where the traffic is and where to reroute you to get to your destination as quickly as possible. The 2 Series can also be equipped with wireless charging and a WiFi hotspot. This allows all your passengers to be connected without worrying about their battery life or data limits. Our team in Kingsport would love to take you for a test drive in the new BMW 2 Series. If you would like to take one for a spin head on over to Rick Hill BMW.